Junior Erica Ogwumike runs the ball up court. Photo by Maria Lysaker/Rice Athletics. Entering this season, there wasn’t much reason to pay attention to the Rice Owls. 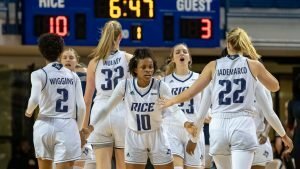 Rice hasn’t made the NCAA Tournament since 2005. Just last year, they entered the Conference-USA Tournament as a five-seed. Even within mid-major rankings, the team hasn’t been considered a force to be reckoned with. But the fact that the Owls didn’t generate a lot of buzz all at once belies the incremental progress they have made over the last four years. This season has been a triumph thus far, but it is the latest chapter in the story of a team that has rebuilt a program from the ground up, going through all the necessary steps to get back to success. Flashy? Rice isn’t known for that, although their program-record 13-game winning streak is starting to change that narrative. There is, however, a lot to admire in how a group of players and coaches have buckled down, got to work, and built a winner. Coach Tina Langley took over the program in 2015, after seven years at Maryland as an assistant, including five as associate head coach. On the surface, the dichotomy between the Terrapins and the Owls was stark: Maryland had just gone to the Final Four, while Rice had finished 9-21 the previous season. Underneath, however, the Terps were going through a resurrection of their own after missing the NCAA Tournament in 2010, and taking a few seasons to rebuild to elite status. That meant there were a lot of lessons for Langley to take from College Park to Houston in constructing a successful program. 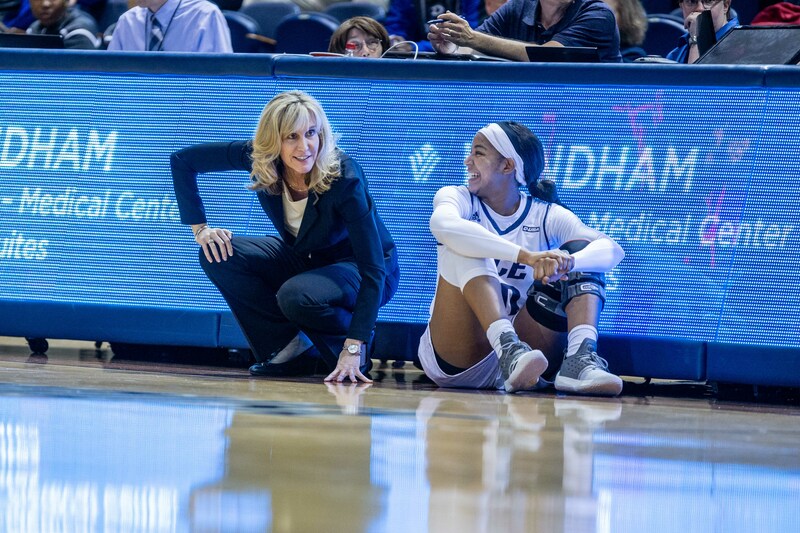 Coach Tina Langley has a word with Shani Rainey before sending her into the game. Photo by Juan DeLeon Studio/Rice Athletics. It helped that Langley found a strong match for her work ethic at Rice, a university that prides itself on academic achievement. Even if the basketball product was lacking before her arrival, she knew she had a group of intelligent student-athletes who were eager to learn. The team could get better quickly because the culture of hard work was already in place. From that point, it was just a matter of recruiting more players who fit that ethos. First came Nicole Iademarco, a transfer who joined Langley in her first season. Then came Erica and Olivia Ogwumike, who transferred from Pepperdine in 2016. Langley and Rice were already a great fit, but the Ogwumikes and the Owls were a match made in heaven. 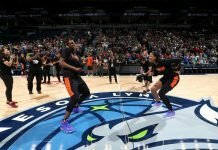 Erica and Olivia grew up in gyms playing basketball with their two older sisters, former Stanford standouts and current WNBA top tier forwards Nneka and Chiney. They started playing at an earlier age than their role models, and basketball has always been a constant presence in their lives. They love the game. The sport also created a platform for the sisters to dream big in their lives, beginning with college. 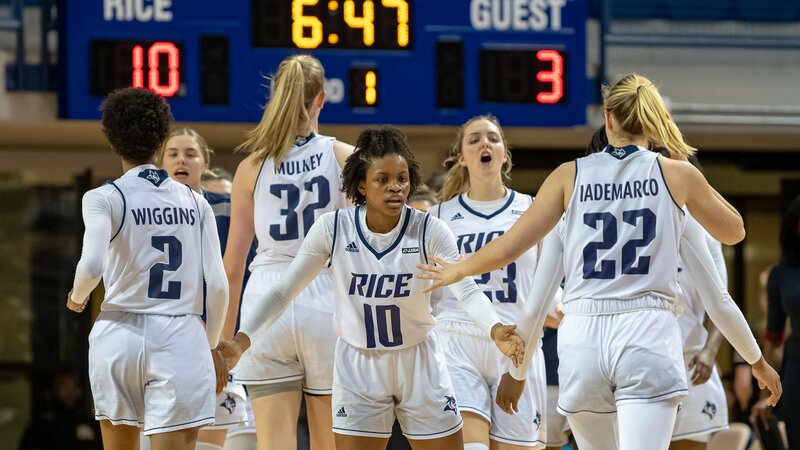 When they realized they wanted to leave Pepperdine, Rice was a natural choice not only for its proximity to their Houston home and in a promising new head coach, but also because of the academic rigor it provided them. Using basketball as a springboard for achievements in other walks of life is something that Erica and Olivia share with their sisters. 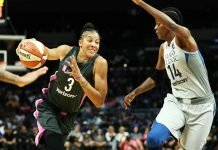 Nneka is the president of the WNBA Players Association, and uses that role to empower women and change the discussion surrounding female athletes in the U.S. Chiney has become an ESPN media superstar, and has advocated for women while helping foster gender diversity in television coverage for the network. The younger Ogwumikes can always count on their older sisters for basketball coaching, and that extends to the entire Owls team when schedules allow for it, despite the pair’s willingness to blend into the background like any other family members. However, their advice to their younger sisters is more about hard work, the mental approach to the game, and using basketball to advance other interests. Players greet each other to start a timeout. Photo courtesy of Rice Athletics. Erica is a pre-med triple major, and Olivia is also pursuing medicine. Although Rice needed the Ogwumikes for their talent and name recognition, the Ogwumikes needed Rice to accomplish their goals, as well. That talent infusion helped spark a turnaround for the Owls that has peaked this season. Erica, the younger of the two, is the engine for Rice. She averages 16.7 points and 11 rebounds per game – the 22nd-best rebounder in Division I. She is a lead guard for one of the most efficient offenses in the country, attacks the basket with abandon, and cleans the glass better than anyone her size, at 5-9. Erica was the preseason pick for Conference-USA player of the year. With the Owls sitting atop the league and undefeated in conference play, she is making that pick look prescient. “Erica is just a tremendous player, she can do so many things,” Langley said. “She is a player who fills the shat sheets. 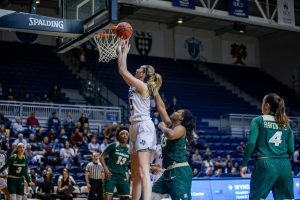 She obviously scores at a high level, she’s a three-level scorer, she rebounds at the top of the country — such an incredible athlete in that respect, as well as her fierceness just fighting as a guard for rebounds. She does a tremendous job distributing the ball, she makes other players around her better, and she really really puts the team above herself. 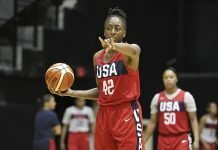 The youngest Ogwumike came into this season having already achieved a great deal in her debut last year. She earned Conference-USA first team, all-defensive team, and newcomer of the year in 2017-18, and focused this offseason on expanding her game. Mostly known as a scorer, Erica wanted to become more patient to improve her court vision and pass better. It’s all part of being a leader: setting aside the individual and putting the team first. Olivia has taken on a leadership role in a different way since she has missed most of the season due to injury. She acts as a player liaison on the bench, helping to bridge the communication between her coaches and teammates. It’s not a position anyone would take willingly – especially someone who is used to leading by example. But Olivia has embraced the opportunity to provide value in any way she can, bringing positive energy and an extra set of eyes from her seat. Langley was effusive in how beneficial Olivia’s presence is because of her attention to detail and her vocal leadership. With great players setting the tone on and off the court, it’s no surprise Rice is enjoying its best stretch in school history. The Owls are undefeated at home and have also won nine straight games on the road, the second-longest streak in the NCAA, with the last two road wins coming against their top competition in Conference-USA. Nancy Mulkey powers in a layup. Photo by Juan DeLeon Studio/Rice Athletics. In addition to Erica Ogwumike’s all-around excellence, sophomore center Nancy Mulkey is averaging 13.3 points, 6.2 rebounds, and 4 blocks per game on 59 percent shooting. 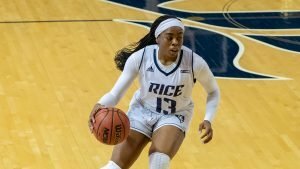 Mulkey also transferred to Rice and missed the start of the year with a wrist injury, but she has developed quick chemistry with Ogwumike, her former high school teammate. Jasmine Smith, Sydne Wiggins, and Iademarco round out a starting five that is blistering its opponents. 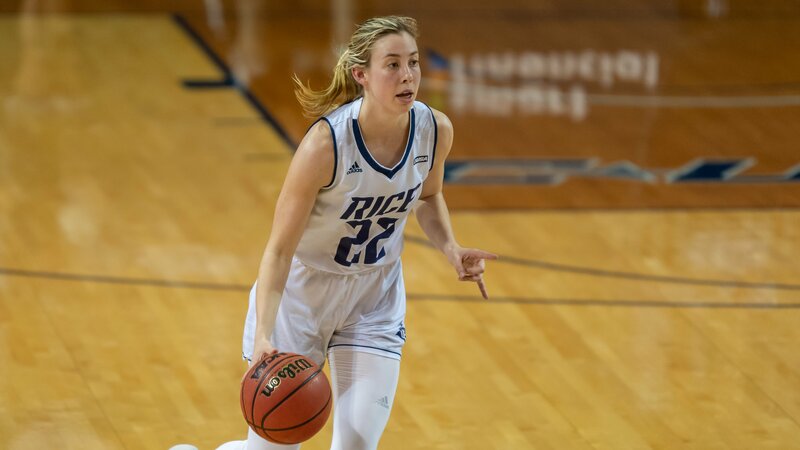 When Langley came to Rice, she wanted to build a program that had the opportunity to play for postseason titles every year, and the Owls have taken a steady path towards that goal. In 2015-16, they finished tenth in the league, and won a Conference-USA tournament game for the first time in four years. They won 13 more games in 2016-17 and were champions of the Women’s Basketball Invitational, the first-ever postseason crown for the school. Last year, they took another leap and played in the WNIT. 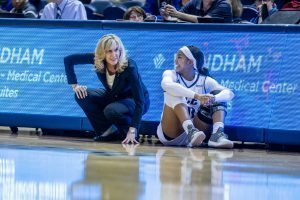 Langley understands that any coach has to be realistic in her goals, but she said the NCAA Tournament is within reach. The Ogwumikes have charted their course in the same methodical manner. They know the respect that automatically comes from the name on the back of their jersey, but they have worked to honor the name in front as well. Whether that’s Erica making minor improvements in seeing the floor or Olivia learning what to say in the moments her teammates come to the bench, they also have traveled the path to success through incremental progress. Nicole Iademarco is the Owl’s second-leading scorer. Photo by Maria Lysaker/Rice Athletics. Erica and Olivia have seen firsthand how their sisters have navigated adversity and become greats at both the collegiate the pro levels, as each was a No. 1 draft pick. And the younger Ogwumiukes take pride in hard work, just like their sisters always have. This season, the Owls started 0-2. They had a lot of new players who needed to learn their roles, and they were hit by the injury bug. Yet they learned quickly and went on to win 20 of their next 21 games. The end of the season for the team has yet to be determined, as does the next step for Olivia, in particular, who is a senior. “You’ll probably always see us doing something coupled with basketball,” Olivia said of herself and her sister. In the present, this much is clear: Langley and the Owls are closer to building a championship-level program than many predicted. The assist they’ve received from two players with championship pedigree has gone a long way in achieving that.